A wise person once said, ‘Before you judge a person, you should walk a mile in their shoes.’ An even wiser person then added, ‘That way, when you criticize them, you’ll be a mile away, and you’ll have their shoes.’ It really makes you think, doesn’t it? At ABF, we wanted you to walk that proverbial mile in someone else’s shoes – not in a judgmental way or in the, “I’m leaving this party and found a nicer pair of shoes on my way out” kind of way either; we wanted you to experience what it was like to ‘Be the Brewer’. Like many small businesses, starting a brewery often means you might not only be the brewer, but also the sales guy, the marketing gal, the delivery person, and who knows what else! Our goal with the ‘Be the Brewer’ contest was to give Albertans a glimpse into what life in the craft beer world is really like. We started by crowd-sourcing the STYLE of this year’s ABF Spring Festival Beer (a Wit), then we held open contests to NAME the beer (The Lion, The Wit, & The Wardrobe), and DESIGN the LABEL. – BTW: Congrats to Josh C. for his winning Beer Label entry. 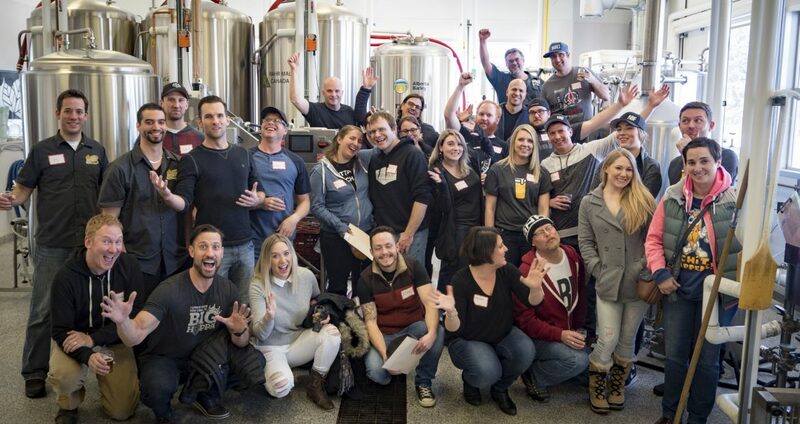 Then on March 6th, all the winners, along with media, sponsors, and other industry people, gathered at the Olds College Brewery to work with head brewer JP and his brew master students to actually brew the beer! The day was an enormous success. Everyone took part in the brewing process, got to sample some of the beers these future brew masters are creating, and got to be part of something we think is pretty special. Back to the many different jobs thing – you can brew the best beer in the world, but people won’t know that unless you can convince them to try it. That’s where the final two stages of our Be the Brewer contest come in. You can CREATE the print or video ad! (2 separate contests). You can find full contest details here. If you win, not only will you take home some fantastic prizes, your work will also be featured at our Festival Launch Events! Want to try the #beTheBrewer Beer?! Speaking of our Festival Launch Events – you’re invited! (My way of saying thanks for reading the whole article!) All you need to do is click on the links below and RSVP to hold your spot. Thanks to everyone who has helped make this contest such an overwhelming success so far. We look forward to seeing the entries in the next stage of the contest! We hope you can join us at one or both of the Festival Launches so we can share all the amazing things we have going on at our spring festivals this year. Maybe I’ll even let you try on my shoes at the event!